Fabricated with code metals, these Obround Sight Windows are suitable for use with vessels conforming to ASME code requirements. They are designed for 150 PSI working pressure and 500ºF service. These Oblong Sight Windows increase the viewing length beyond that of conventional sight windows. The angle of vision into a tank or vessel is enhanced so that more of the process liquid can be observed from a single viewing location. 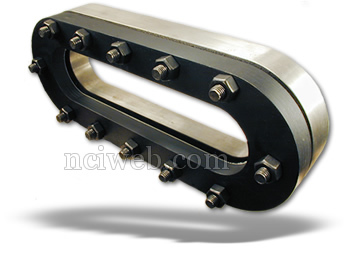 They may be specified with flat or curved welding pads for insertion into or attachment to tanks and vessels. Dual window units may also be specified for this style sight window. 1 x 6 3-5/8" 8-5/8" 1-1/4" 2-3/16"
2 x 12 5" 15" 1-1/4" 2-7/16"
3 x 12 6" 16" 1-1/2" 2-13/16"
3 x 18 6" 22" 1-1/2" 2-13/16"
4 x 24 7" 28" 1-1/2" 3-1/4"